The direct-acting compressed air presses of the DA series are table presses for joining and forming with or without force/path monitoring as well as for punching, used for joining by pressing, joining by forming or flanging, for cutting by punching or cutting as well as for embossing or moulding. The press movement provides a constant force profile over the entire stroke. The pressing force is generated by up to four press cylinders arranged one above the other. Only one cylinder chamber is used for the return stroke. The press units allow press forces of 1.5-34 kN and the pressure can be lowered by the reduction of the inlet pressure. As standard, working strokes of 40, 60, 80, 100 and 120 mm are available. An end position attentuation is provided for the working stroke. The press-in depth can be adjusted with a knurled nut with an accuracy of 0.05 mm over the entire stroke. The force-distance monitoring is carried out by means of windows or by means of envelope curves. For the construction of manual workstations, a model-tested two-hand safety control is available. Direct acting compressed air DA presses are used in automatic processing stations or for the construction of manual workstations, which can require a force-path-monitored joining quality with the opportunity of documentation. 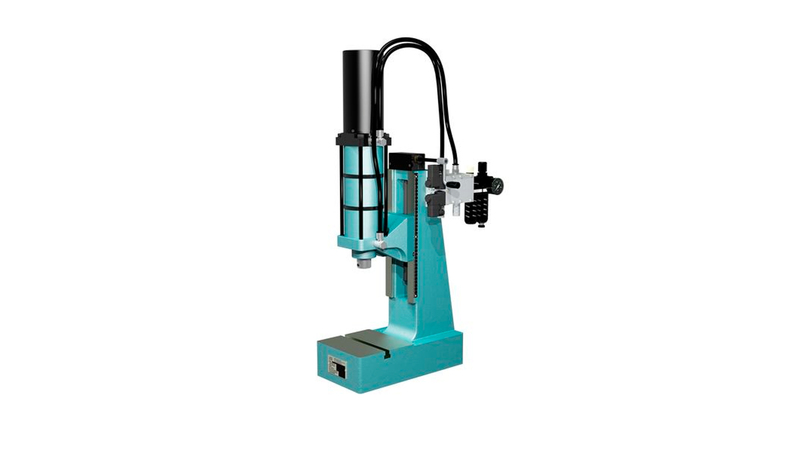 The pneumatic presses offer a simple and cost-effective solution for applications with high cycle speeds and nominal forces of up to 34 kN. The versatile presses can be found in many areas of assembly. Typical user industries are the automotive supply industry, mechanical engineering and the electrical industry.